Workers want fair pay and better healthcare. 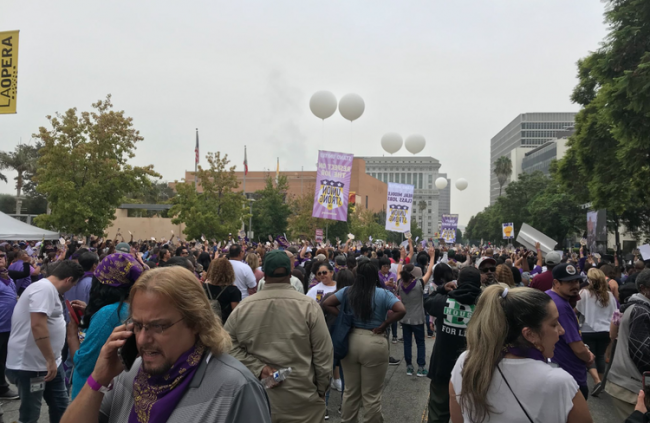 Hundreds of county workers rallied on streets in downtown Los Angeles today, demanding higher wages and health care contributions as their union contracts are set to expire. Service Employees International Union Local 721 represents more than 60,000 registered nurses, social workers, parks and recreation staffers, janitors, clerical staff and others whose labor contracts expire Sunday. The union says county jobs have offered a path to the middle-class and set a standard for public sector jobs, but the region’s “skyrocketing” cost of living is hitting members hard.More than 100 of those employees filed into a meeting of the Board of Supervisors, while hundreds more watched on a big screen outside. SEIU Local 721 Vice President Linda Dent estimated the crowd totaled 3,000 workers. The union told its members last month that managers were offering a 7 percent increase over three years and seeking a three-year freeze on some health care benefits. A refusal to raise contributions to health care premiums in a period of rising costs would be amount to a pay cut, said Carlos Rosales, who works for the Department of Beaches and Harbors and was one of five representatives speaking on behalf of union members. In a statement emailed to City News Service, Chief Executive Officer Sachi Hamai declined to comment on specifics, but said management and labor interests were aligned. Supervisor Sheila Kuehl, who chairs the county board, accommodated the union by allowing its representatives to speak out of turn so that the hundreds of workers — who she said turned out on their own time — could get back to work. “We appreciate our workers and I just want you to know we do hear you,” Kuehl said.